Recently, Conor McGregor has been extremely active with his social media, reliving past glories with Paulie Malignaggi, starting a culture war with Khabib Nurmagomedov, and even retiring from MMA. Last night, he kept that trend alive, interacting with his fans on Twitter, responding to questions, and, as always, hawking his Proper 12 whiskey. But amid the ever present whiskey plugs there were also a few notable comments about his fighting history and future. Replying to a fan’s question asking him about his footwork his fight with Khabib, McGregor revealed that he sustained a serious injury just a few weeks out from the fight that hindered his movement in the cage. I broke my foot 3 weeks out from the bout. I still marched forward however, and also landed the final blows of the night. On his blood brother. I am happy with how the contest went and the lessons learned. In my fighting and more importantly my preparation. Time will reveal all. It’s no secret that McGregor has been angling pretty hard for a rematch with Nurmagomedov. Last month, McGregor blamed a drop in dedication as the cause for his loss to Nurmagomedov and said that a rematch must happen because there was dispute hanging over the bout with the brawl that ensued afterwards. This is the first revelation of an injury impeding his performance in the bout. When fans questioned what McGregor could be happy about - after all, he was thoroughly dominated for most of the bout - McGregor was unflappable, saying that his defense was still excellent and not as bad as everyone thinks. Very happy with my defense. A precarious position with the head pinned against the fence. Every movement must be calculated as any over exertion leaves the guard open and could lead to a finishing blow. None of which came close.Zero facial damage taken and I won the next round. McGregor did go on to win the third round following this flurry. He was then submitted with a neck crank in the fourth. All in all, this is a lot of fight talk from a man who is ostensibly retired, and that may be because he likely is not actually done with MMA. Most fans believed his recent retirement announcement was a negotiation tactic in his continuing quest for equity in the UFC. After his Twitter war with Khabib, McGregor announced that he would “see you in the Octagon,” supporting the idea that “Notorious” wasn’t really done with fighting and then last night the former two-division champion revealed he was still in talks with the UFC about returning. In talks, in thoughts, and always and forever, In training! But first, McGregor has some legal troubles to deal with. 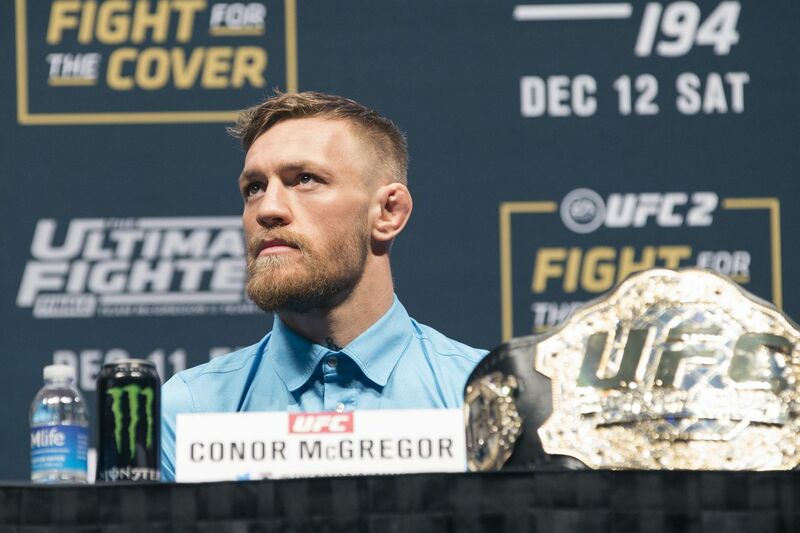 Just yesterday McGregor pleaded not guilty in his alleged phone smashing case in Miami. He has a scheduled court appearance on April 30 and a scheduled trial hearing on May 13. Bad. Estranged girlfriend of B.J. Penn granted restraining order against him. Smash. Conor McGregor enters not guilty plea in cellphone smash case, new video emerges. Good questions. Dustin Poirier on Max Holloway: ‘Can he trade shots with me is the question’. Fine. UFC’s Paulo Costa fined by NYSAC for undisclosed violation, says it was for ‘stomach medication’. Supermatch. Ben Askren to wrestle Jordan Burroughs at Grapple at the Garden. Heavy Hands. Previewing UFC 236 and the two title fights on it. Fights Gone By. Jack Slack on UFC 236 and the fallout from T.J. Dillashaw. Cody is not gonna let this one go ever. Conor is apparently going to make the Champ Champ rose, which is actually a genuinely good idea. Hahaha thank you, but that Rosé is coming without A doubt! @kaikarafrance let’s dance, I want to keep these flyweight fights alive.. everyone has either bailed on the division, or is already booked!!! I dunno, this doesn’t feel like a great thing to admit. See why? People gonna be making that joke a lot. Fighter commentary with Max Holloway. Yushin Okami (35-12) vs. Kiamrian Abbasov (20-4); ONE Championship, May 3. Jussier Formiga (23-5) vs. Joseph Benavidez (27-5); UFC Minneapolis, June 29. Mads Burnell (11-3) vs. Dean Trueman (10-4); Cage Warriors 106, June 29. Luke Rockhold (16-4) vs. Jan Blachowicz (23-8); UFC 239, July 6. Conor is gonna fight the winner of Max-Dustin in July. Bet it.